Dr. D is Dancing for Opportunity! 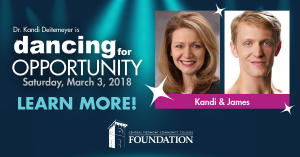 Dr. Kandi Deitemeyer, president of CPCC, is participating in the Charlotte Ballet’s upcoming Dancing with the Stars of Charlotte Gala on March 3, 2018. The event pairs local stars from some of Charlotte’s most esteemed corporations and educational institutions with professional dancers from the Charlotte Ballet to raise funds for local charities. Dr. Deitemeyer will be on “Team Kandi & James,” competing to raise funds for CPCC’s Opportunity Scholarship Initiative. Find more information here. For those interested in sharing information about this fundraising event on their own social media channels, view the online social media toolkit at the bottom of the Foundation’s Web page.